(1) Smart contract: we completed the process test and problem repair after integrating the smart contract to the local full-node; we completed the transaction record and account information, besides, we discussed and determined the optimization design of world state data integration. (2) inWallet3.3.0: we completed cross-chain exchange rate to obtain bug fixes; we completed cross-chain transaction bug fixes; we completed multi-chain wallet transaction bug fixes; we completed regression test of multi-chain wallet, transaction, chat, news, settings, cross-chain, and other functions. (3) Mainnet test: we completed the relationship test of consensus node number and performance, the relationship test of CPU and performance; we completed Docker deployment test and document preparation; we completed abnormal recovery processing of single node snapshot; we completed node consensus data archiving and 50% of recovery tool development; we completed 10% of overall company's alpha test (testnet + inWallet). (2) Developer Center: we completed 50% of function development; and 50% completion of front-end page. It is reported officially that InterValue reached a strategic cooperation agreement with Hunan Jiuyuan Cultural & Tourism Development Co., Ltd on January 10, 2019. Hunan Jiuyuan Cultural & Tourism Development Co., Ltd is committed to the development of tourism projects, the cultural and artistic exchange activities, as well as cultural tourism development and ecological agriculture tourism development. It is the core operating enterprise of the digitalization of cultural assets, which realizes the intellectual property and travels. At the same time, it creates an ecological business model of quality consumption, providing the public with a healthy and happy cultural industry chain. 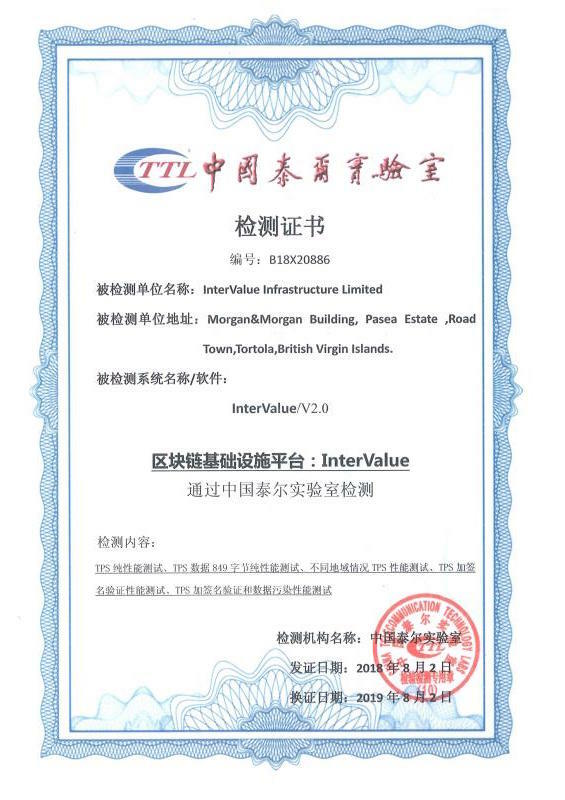 InterValue will provide technical support for the application of the Hunan Jiuyuan Cultural & Tourism Development Co., Ltd in this strategic cooperation. The two sides will jointly explore the blockchain scenes in the in-depth cooperation on blockchain technology and cultural tourism applications. Hunan Jiuyuan Cultural & Tourism Development Co., Ltd will carry out the research and development of the Blockchain + Cultural & Tourism Industry based on the technical support provided by InterValue. InterValue held the activity- Happy Laba Festival – INVE For Free from January 11th to 13th, 2019. The majority of the community members participated in the event.